Because really, August 5th is my last day, I present my research on next Tuesday the 26th, sooo, I have a total of 13 days left in the office. YIKES! And only 5 until I have to present all this work. Oh boy. 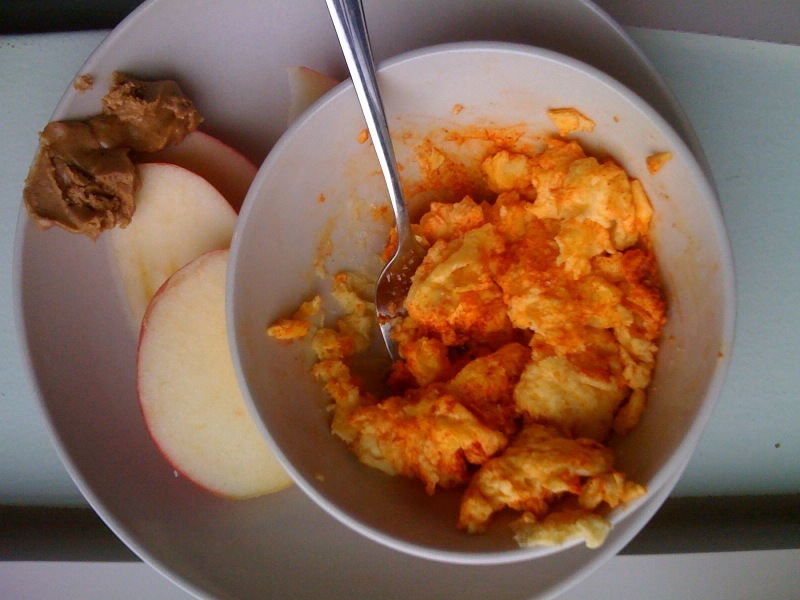 Two egg whites with turmeric, and a few slices of apple on the side with almond butter. Yum! I then packed up my things and my coffee to go, and walked to work again! I must be totally losing my mind because it was already 80 degrees when I left this morning and full on humid. I was dripping with sweat by the time I got here 1.7 mi later. 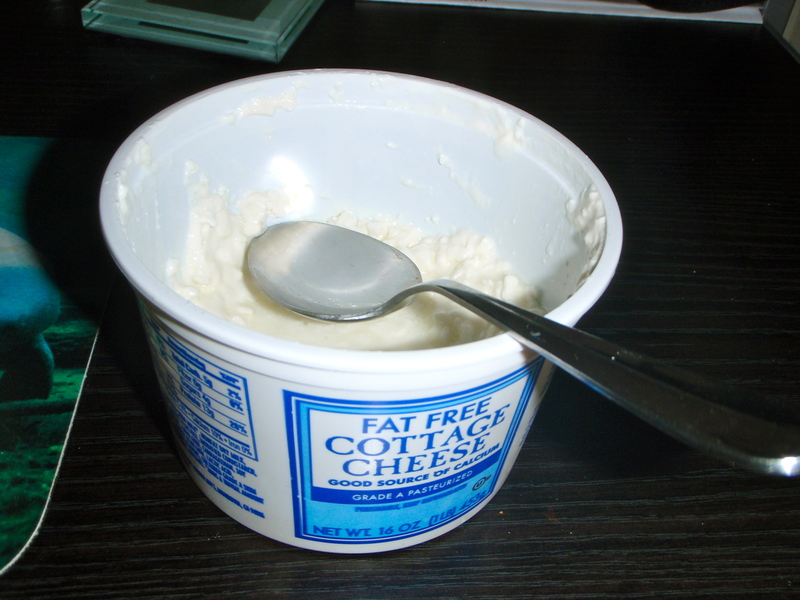 It was gross. I cooled off in the bathroom and changed and felt better. Why did I choose the HOTTEST week in DC to start walking to work every day?! Anyway… I’m glad I did it, feelin good! Happy Tuesday! My alarm went off at 6:30 this morning and I felt pretty rested. My first thought was that it was Friday (hooray!) and the second thought that entered my mind was the Friday Song. Oh boy. After trying to get the song outta my head I got up and got ready for the day. I wanted a light bfast today (even though I really wanted more overnight oats) because I know my supervisor is taking me out to lunch (hopefully chop’t salads) and because I know I’m going out to dinner with my dad later, so I figured start it off light! 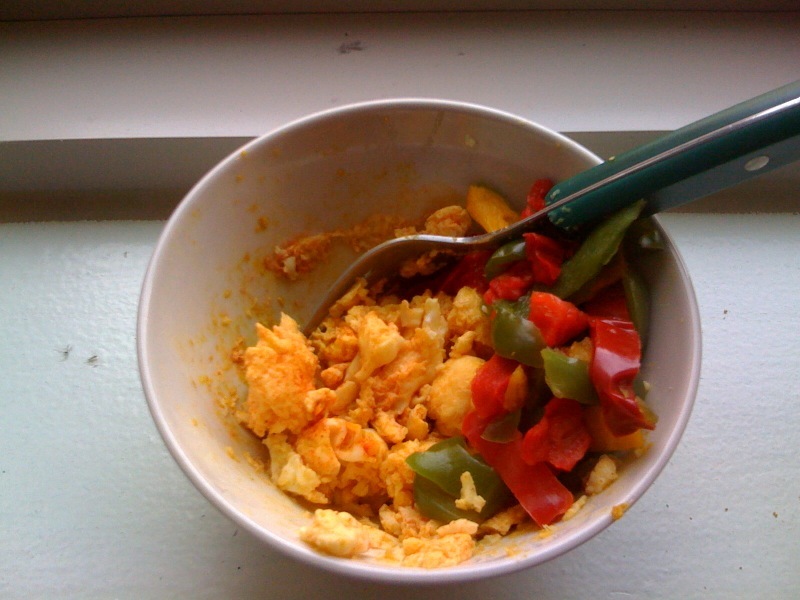 The usual – two egg whites (one real, one from a carton), peppers, turmeric and nutritional yeast. Coffee and cinnamon. Time for work, Happy Friday!! 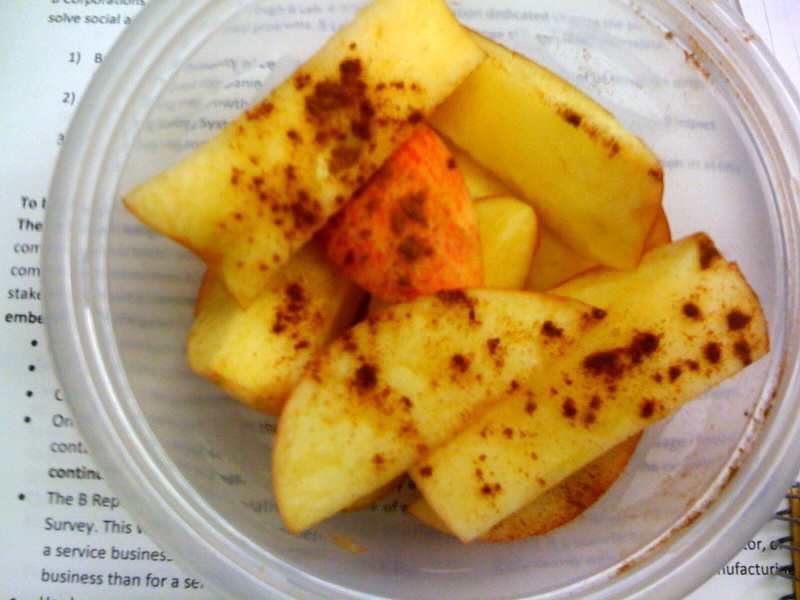 A sliced apple with cinnamon. On the way home I walked through the farmer’s market trying to keep in mind that I shouldn’t buy too much tasty-looking produce since my dad is coming this weekend and as of right now, our plans include a fair amount of eating out, so don’t want to stock up on things and have them go bad. I did know that I desperately needed fresh fruit! 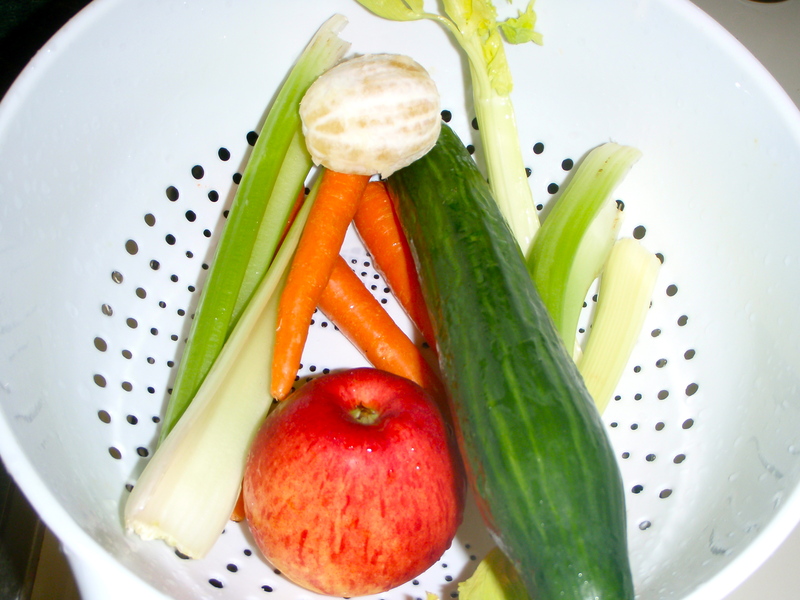 I’ve got plenty of frozen veggies and canned beans to last me quite a while, but fresh fruit – no replacement there! 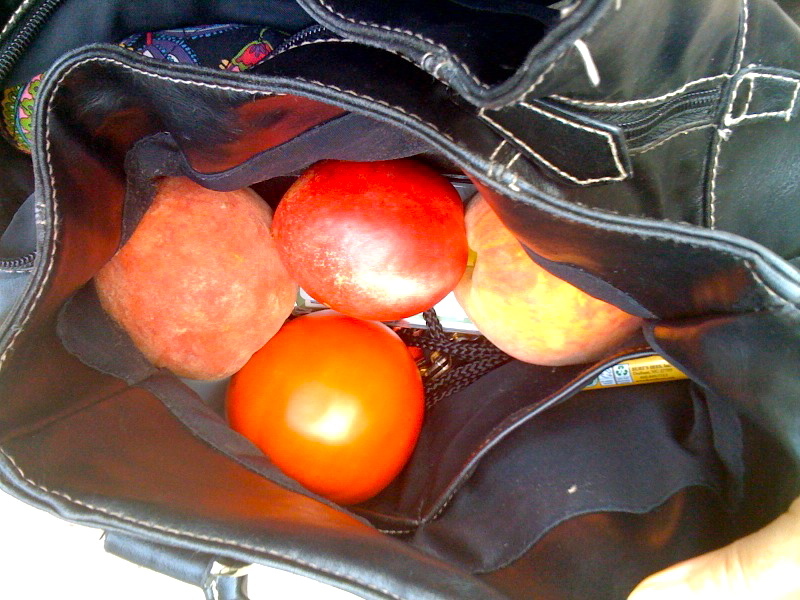 I picked up two peaches, one nectarine, and one tomato, they were beauties! And nestled safely into my purse. Now I’m gearing up for a long run with Melissa, so I just had a pre-run snack. Hoping it settles well (still 45 mins til we’re moving, so should be ok!) 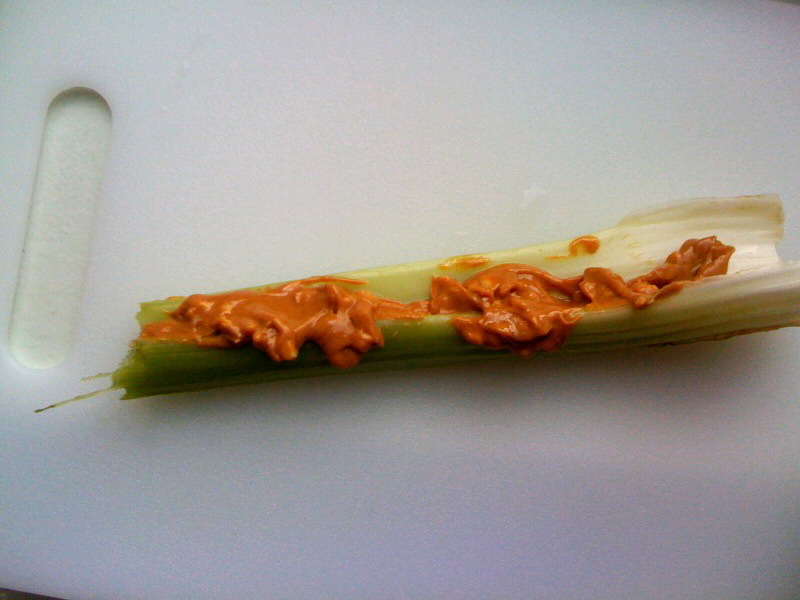 Celery stalk with 1 tbsp of peanut butter. Hit the spot. 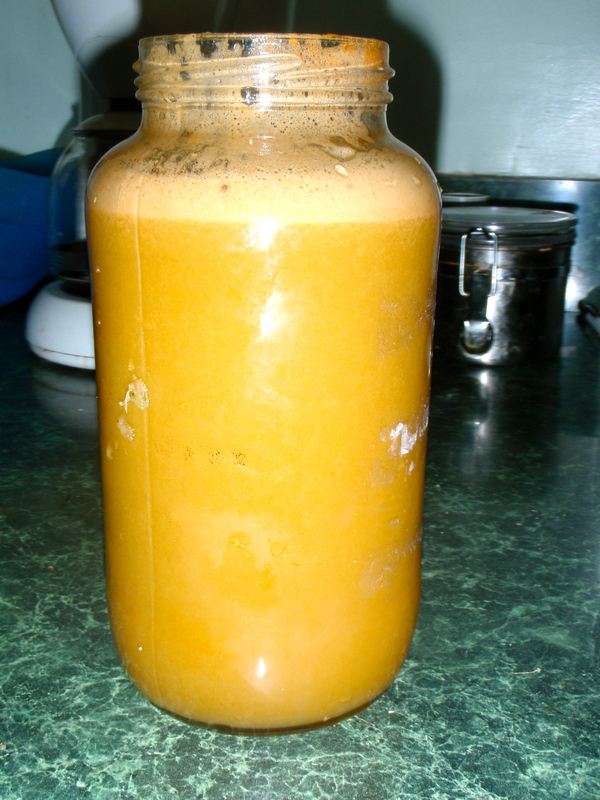 I scooted home and made some JUICE! 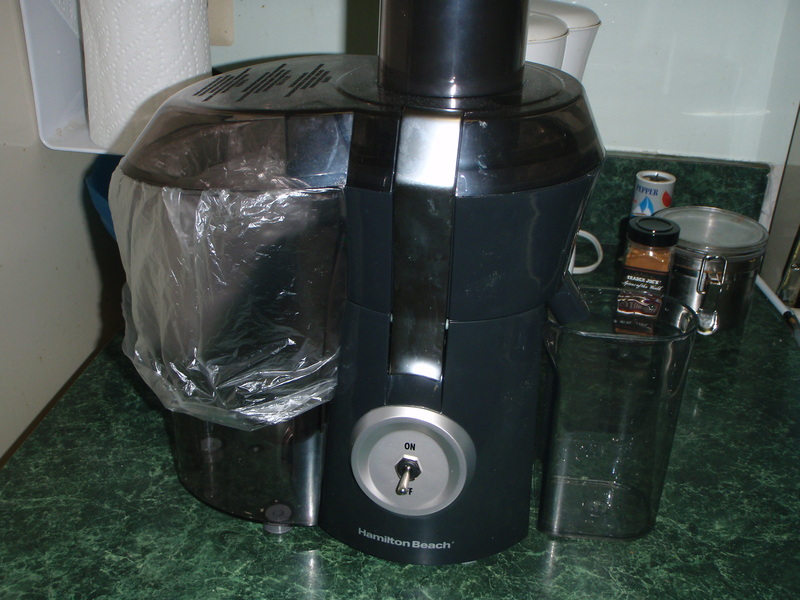 Haven’t used the juicer since I moved to DC and it was about time! It’s a beautiful day here too so seemed appropriate to have some super fresh juice after a good workout and go sit in the sun. And now it’s time to shower, finish packing, and get on the metro to the airport! Catch you later. Happy Wednesday! Since tomorrow is my Friday, it’s almost the weekend! Today has been a fun day so far. 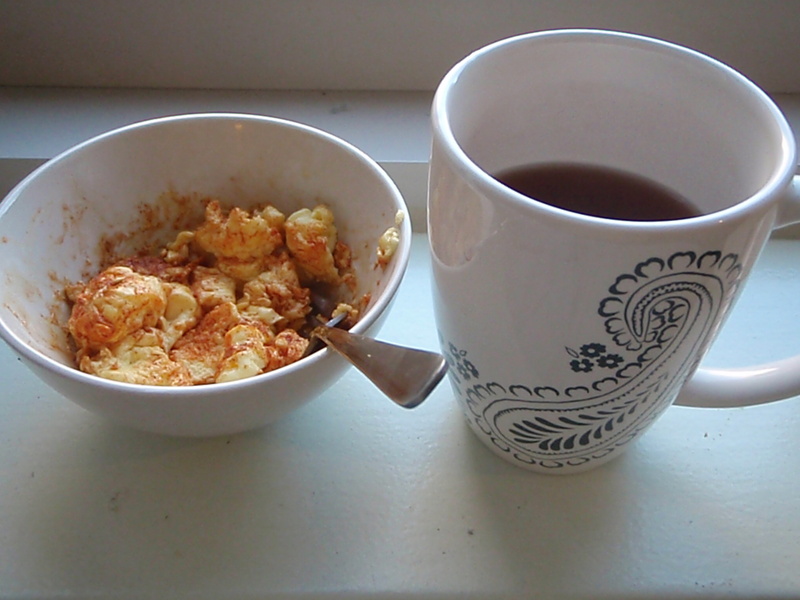 Started off with two egg whites and turmeric, with a cup of raspberry tea. 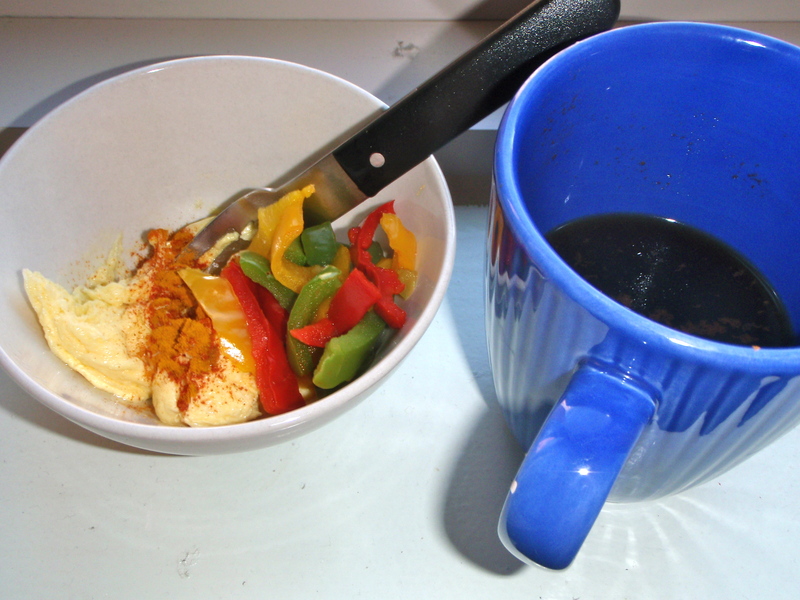 Skipped the veg with breakfast today because I thought I was going to Chop’t with my supervisor today for lunch and I figured it would be laden with veggies. On my way into the office this morning he texted me saying to meet him and one of our coworkers at sbux. In addition to my travel mug full of coffee, I had a grande black coffee with them and enjoyed chatting for about an hour in the coffee shop – not a bad way to start the day! And highly caffeinated. Back at the office we got an email saying a coworker had brought in a whole bunch of leftovers from a cookout and that us (unpaid) interns should eat them all up! My supervisor said we might as well take advantage of this rather than head to chop’t (I was a little bummed, as I was excited about trying out the popular chop’t salads I’ve heard about, and because cook-out fair is often not so vegetarian friendly.. but it all worked out well) I made a nice high-protein (but sadly a bit low on veg) plate. 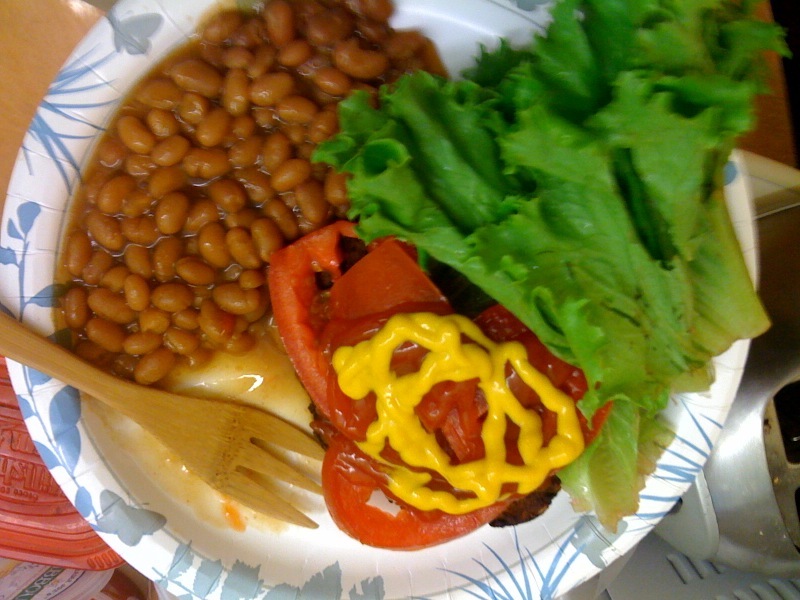 vegetarian baked beans (I double checked), pile of lettuce, pile of tomatoes, and hidden under there is a black bean burger which was quite tasty. ketchup and mustard, too. 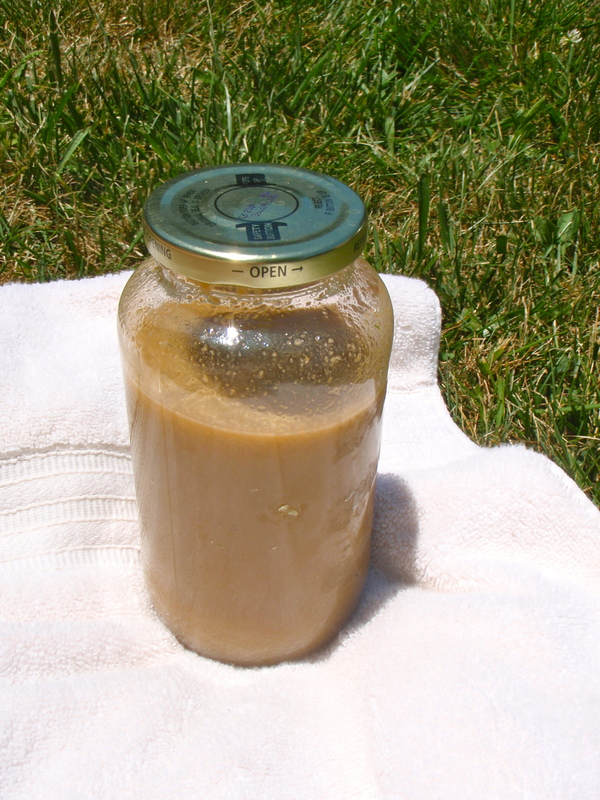 I steered clear of the carb and mayo-laden potato salad, white hamburger buns, and cole slaw. Not a bad lunch, and free :) I find it can be really challenging to eat healthy when unexpected meals come up, but this one worked out well. We just got an email about an “urgent birthday celebration at FroZenYo” – it was one of the interns birthdays on Monday but no one knew! Sounds like we’re going to have a little field trip celebration this afternoon – I’ll need to choose my froyo carefully! C ya later. Welcome to Peanut Butter Trees! 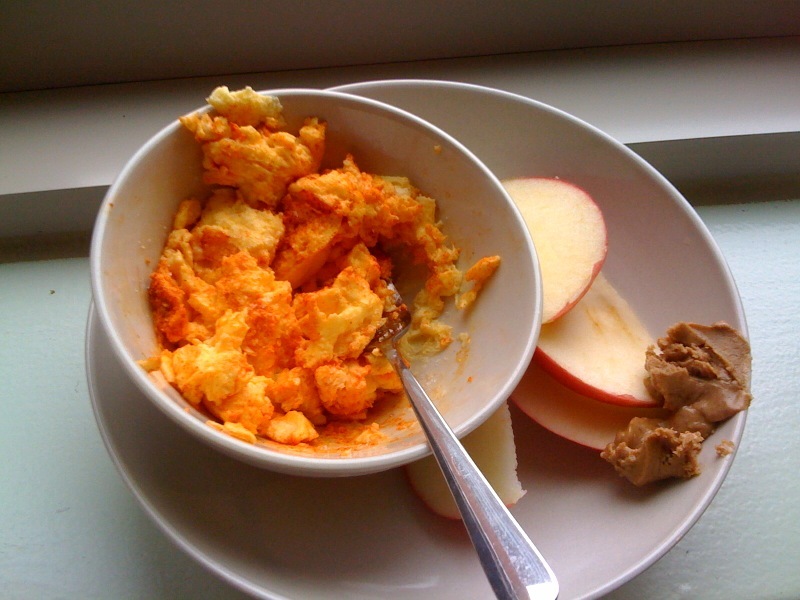 Welcome to my food, fitness, and living blog. I'm Margo, a 26 year old halfway through graduate school in Connecticut. I hope you enjoy reading about my summer of vegetarian munching, moving, and playing through photos and blurbs. I am in no way a dietician or any sort of expert on health! And I don't post everything that I eat. peanut butter trees · me. food. nature. go!